What do kids think about economics? Watch this video to see elementary, middle and high school students talk about the importance of understanding economics and personal finance principles. You’ll be surprised to see how insightful these kids are when they talk about viewing the world through economic lenses! Last month, the OECD Programme for International Student Assessment (PISA) presented the highly anticipated results of a worldwide study on financial literacy education, thanks in large part to the efforts of CEE Board Member Annamaria Lusardi. PISA tested 15-year-old students from 18 countries, comparing financial literacy performance on a global scale to help identify effective national strategies and best practices. 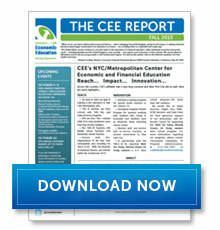 Click here to see presentation and discussion of its key findings. Despite modest progress in implementing financial education over the past few years, American students performed squarely in the middle of the pack, far behind nations like China and and Belgium. But on the bright side, these results have helped shine a spotlight on the need for improvement: Associated Press and others have cited data from the Survey of the States as an important indicator and benchmark for progress. Click here to view some of the highlights. “When we do not teach children about personal finance—about managing household budgets, saving for the future, or making informed decisions about larger investments in an education or a home—we are failing them in a shameful and costly way. June 30 is the final day of CEE’s $175,000 Challenge Grant. Join in the effort to keep opportunity and optimism alive for America‘s youth. And, demonstrate your own financial literacy by taking full advantage of this matching grant opportunity! We depend on donors to continue to utilize the best educational technology, build new programs to meet evolving needs, and develop the most up-to-date resources. Thanks to the generosity of our donor, Scott Booth, and our Board Co-Chairman, Barry Haimes, all gifts received by June 30 will be matched dollar-for-dollar up to $175,000. $150 donation trains one teacher in interactive classroom learning activities. That teacher will reach 50-150 students each year. $500 donation outfits a classroom with books and materials about earning, saving, investing and managing money. 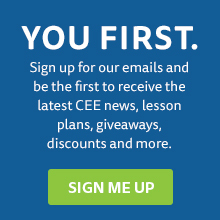 $1,250 provides a full scholarship for a teacher to attend CEE’s highly regarded 52nd Annual Financial Literacy and Economic Education Conference, where educators share best practices and receive training on new resources. 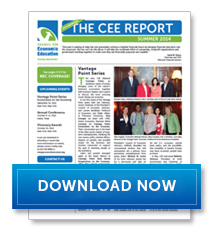 The educational programs coordinated by CEE would not be possible without the generous contributions we receive from businesses, private foundations, government agencies and individuals like you. Lusardi’s 2011 study, “Financial Literacy Around the World: An Overview,” researched countries across the globe, and how men and women measure up, view financial literacy, and which countries have the best understanding of basic personal finance concepts. Lusardi said women in all the countries studied were less likely than men to correctly answer questions about financial literacy, particularly those that used technical terms. The more sophisticated the question and the more financial jargon that was used, the less likely women were to answer the questions correctly. Read the full story on the gender gap and financial literacy here.